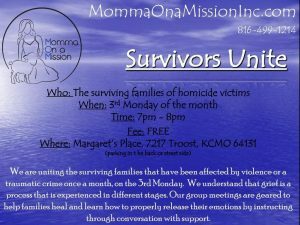 Momma On a Mission, Inc. will unite the surviving families that have been affected by violence, homicide or a traumatic crime. We understand that grief is a process that is experienced in different stages. Our group meetings are geared to help families heal and learn how to properly release their emotions by instructing through conversation with support. Meetings are facilitated by our Counselor, Ms. Sheila.